PeopleSoft uses DPK for almost all kinds of install and deployment which are delivered in zip files. Have you ever wondered what those DPK files that you download and deploy contains? In this post we will go over the contents of DPK files. When you download PeopleSoft Image DPK , there are number of zipped files that are downloaded and each of these is then used to setup PeopleSoft Image for PeopleSoft Update Manager. These zipped files contains the software and scripts used for PI deployment. So you need to make sure that these files are downloaded completely. 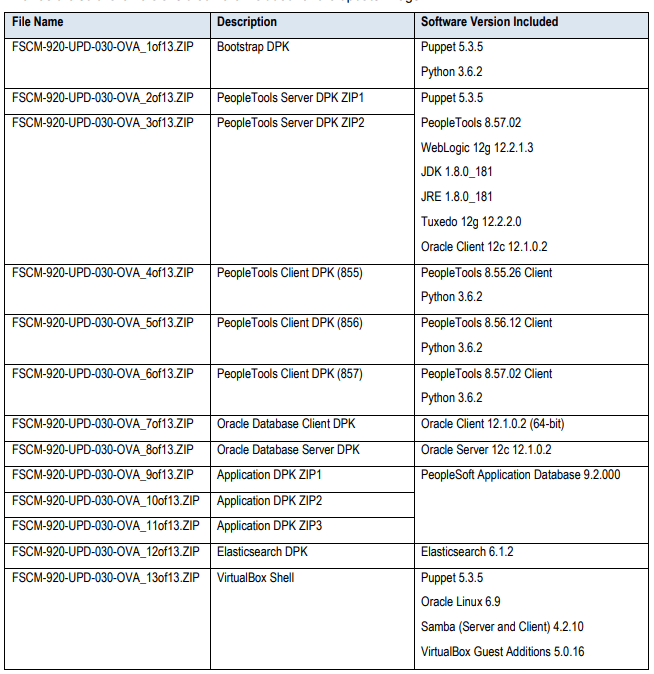 Part 13 – Oracle Linux and other software such as Puppet etc. This is the first part that you need to extract to start the process of DPK deployment and this contains the bootstrap script for extracting remaining zipped files and start the configuration. It also has python and puppet files. This contains the DPK files for PeopleTools deployment for the PeopleSoft Image. Software such as Weblogic, JDK, Jre, Tuxedo are included in this. This contains the tools client for older PeopleTools version that can be installed on client machine. Database client that can be accessed by end user during PeopleTools client install. Oracle Database server to be used during PI deployment and run Oracle database for PUM inside VM. Contains the PeopleSoft application database. Contains the Oracle Linux shell to be imported in Virtual Box and other software that are needed during the PI deployment and other tasks. Total number for parts available for download and their content may vary between different PeopleSoft Image or other DPK types. Always refer to the manifest for these DPK files to verify the content and software version. What is a PeopleSoft Image Manifest? 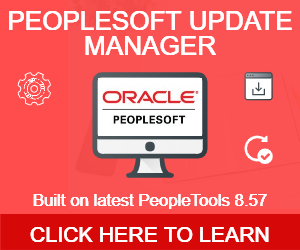 What are the version of software delivered with PeopleSoft Image? What is the version of PeopleTools delivered with PI? What is the Elasticsearch version ? What is the Oracle Database version? All the above questions are answered in the Image manifest. Image Manifest is the document that is provided with each PeopleSoft Image DPK and contains the list of content of DPK files as well as the version of software such as PeopleTools, Oracle Server and Client, Elasticsearch etc. Here is Image Manifest for Virtual Box Image 30. 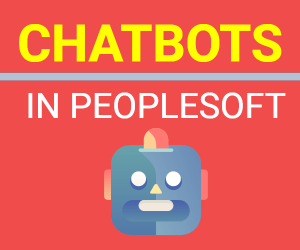 Now you are aware of what is in PeopleSoft DPK files and how to check the software version of PI.